Why do your beaded necklaces have three alternating red and black beads? Not all of them do, just the ones with clasps. The reason why is because if a beaded necklace isn’t done in the traditional pattern for a particular Orisha all the way around, it may be a less effective talisman if Eshu isn’t called to “open the gate”. The three beads are put on at the beginning of necklaces to make sure that it is clear that it is a talisman. If for some reason such as an accident or a fight, the necklace is broken, please remember to put red and black beads at the beginning, when you re-string it. Why do you make so many charms from cowrie shells? Cowrie shells were considered currency to the Yoruba people. They also belong to the Orisha called Aje Shaluga. Aside of their monetary value, they are used to make the sacred helmet and attire for Shango. The helmet is the home of his sister Bayanni. When a talisman or amulet is made from a cowrie shell, it’s like giving an offering to the Orisha so that you know that they know that you know you value them. Do you offer custom work or ceremonies? Yes we do. Please use our contact form to make your request. Do you offer “money back guarantees” for rootwork and spells? If you can figure out how to un-offer an offering, un-make the supplies, un-observe a deity, and give me the time and energy I spend doing rootwork and spells, I’ll start giving money back guarantees. Notice, the people who do offer this guarantee have no photos of themselves doing anything or spending anything to do the work. At most, you’ll see photos of them doing the equivalent of intense wishful thinking. Most of the time they have none, or sometimes stolen ones if they’re really bold. In a few traditions, they aren’t allowed to take any photos at all of any ceremony or sacred items, and I respect those. I have limits on what I’m allowed to photograph or record in audio or video. They can however, take photos of the places they go to do the work, and some of the preparation…at least the supplies they bought. I sometimes even send the tracking numbers for supplies that I order, so people can have a time frame for when they’ll receive their items. This is not to say that *every* sorcerer without many photos on their site is a fraud or bad. Some are just more private than others. Some don’t believe in photos, but their knowledge speaks well enough for them. Some don’t post much on their sites, but do send photos to clients. Back to the “money back guarantee”, though I can’t give guarantees because this is arrogance that the spirits I work with, and deities I worship find unacceptable, I can say that I trust the spirits. I have not yet seen any case of a person giving offerings, following the instructions, and using the supplies, and not being blessed. It’s like gravity…forces of nature. If you do the things Eshu likes, he will bless you, and it will add power to works related to him. If you do things Oshun likes, she will bless you, and it will add power to works related to her. In some cases, especially involving the emotions of other people, they are resistant and stubborn. Sometimes no matter what the Orishas do to guide them, they choose not to go the way they are pushed. It happens sometimes. 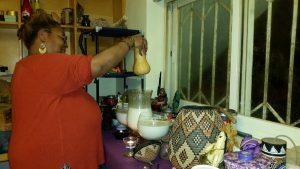 In these cases, the Orishas still bless the one(s) who respected them and gave offerings and prayers. So no matter what, they will take care of you if you respect them. I have witnessed some amazing things. So if you need guarantees, I am not the right sorceress for you. However, if you are willing to allow the spirits to work wonders in your life, then let me show you why I trust them so much. The vast majority of testimonials posted online are fake. It is very rare for someone to post a real testimonial on their own site, and when they do, it’s usually from a fairly well known spiritual person who “outsourced” to another sorcerer, which is cool. They can then basically trade advertisement. It’s still not very common. Ask yourself: are you willing to post personal information about spells or rootwork you have requested? Would you take the chance that your enemy or lover you did work on would find it when they are searching for services, or suspecting that they are under a spell or curse? If people I have served wish to sing my praises or recommend me, I have no problem with it. By the same, I welcome constructive criticism. If someone is being honest, they will say that I am a bit slow at times, and not very talkative (because I can’t be chatting online and doing the work at the same time), but I am thorough and usually effective. If you would like to post a testimonial about me, I would rather you host it on your site than here at mine because people need to be able to tell that it is being made by a real person and not a fake persona. If you have a blog or other post about me, feel free to post a link to it in the comments. It may help in advertising your work as well since it is good to circulate money, service, and good will in the community of spiritual people. Hi – was wondering if you do reconciliation work? Hi……….I had the same question as andrea did. I have the same question as previous inquires. Hi, do you do reconciliation spell? I want to bring back my ex boyfriend. Yes, I do reconciliation spells, but under certain conditions. I have to do an initial coin reading to see if the relevant Orishas (Eshu, the Ancestors, and Oshun) approve of the relationship continuing. This bit is free, so send me an email so I can tell you whether or not we can do something. Can you help renew or heal a troubled friendship? Need help things went wrong that should have not gone wrong with friendship. Things are misunderstood a lot is my fault. Hurting bad.